The Crumpet: Indie Week - Pam's Girly Bits - Mother May I? Mother May I? is absolutely gorgeous. Not only that, IT'S PURPLE!!!! Well, lilac. 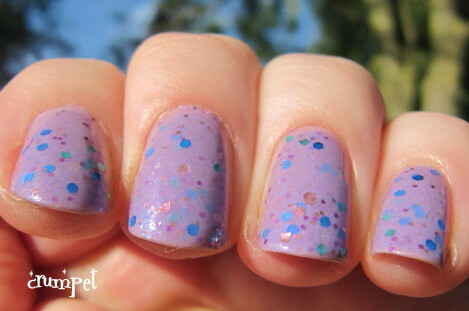 How long is it since we had purple / lilac goodness on the blog? Answer - TOO long! 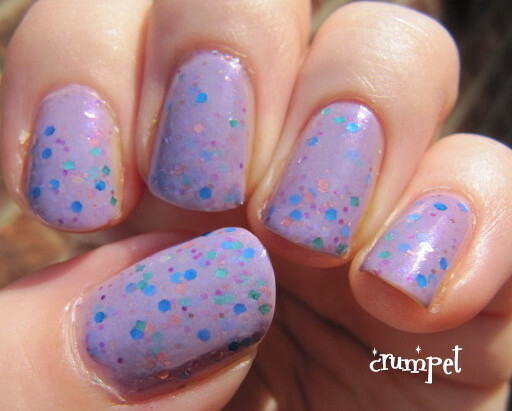 This applies beautifully and silkily, with no issues whatsoever, and just looked dreamy on the nails. The base is a milky medium lilac, a bit like a diluted Planks A Lot. It's then shot up with peach, blue, pink and aqua glitters - including squares !!! Unfortunately, the one ingredient that makes this polish so VERY special remained elusive to me - those gorgeous red square glitters. They just would NOT come out of the bottle, but to be honest, I was probably too lazy to shake the bottle for more than 3 seconds - I wanted the lilac on my nails stat! 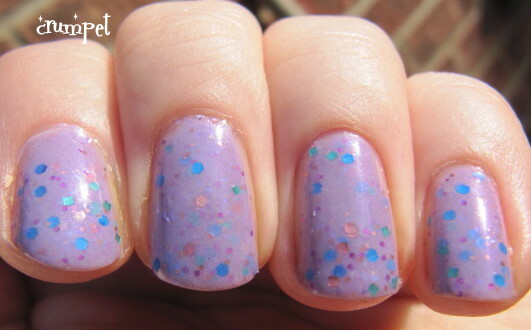 For me, this is probably a summer-only polish, but it's so beautiful you might want to wear it all summer long. Pam now sells her polishes through Llarowe. Labels: Pam's Girly Bits Mother May I?